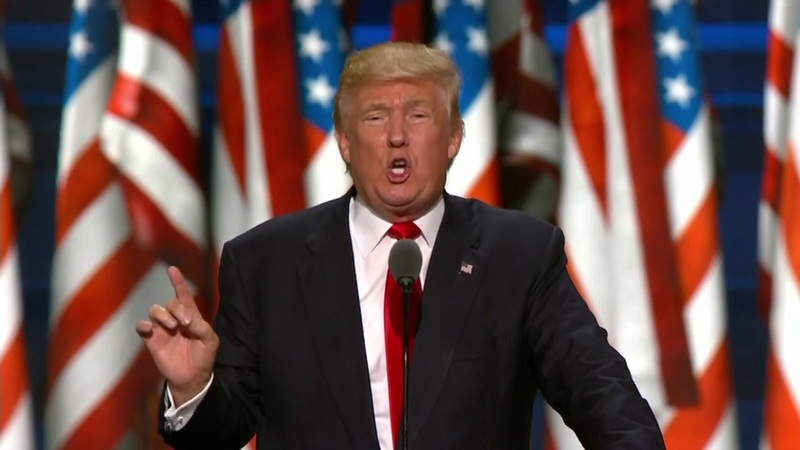 Donald Trump accepted the Republican party's nomination for president on Thursday night. CLEVELAND -- Declaring America in crisis, Donald Trump pledged to cheering Republicans and still-skeptical voters Thursday night that as president he will restore the safety they fear they're losing, strictly curb immigration and save the nation from Hillary Clinton's record of "death, destruction, terrorism and weakness." Donald Trump accepted his party's nomination on Thursday at the RNC. The 70-year-old celebrity businessman's acceptance of the Republican nomination caps his improbable takeover of the GOP, a party that plunges into the general election united in opposition to Clinton but still divided over Trump. Underscoring his unorthodox candidacy, Trump doubled down on the hard-line immigration policies that fired up conservatives in the primary but broke with many in his party by promising protections for gays and lesbians. His address on the closing night of the convention marked his highest-profile opportunity yet to heal Republican divisions and show voters he's prepared for the presidency. Ever the showman, he fed off the energy of the crowd, stepping back to soak in applause and joining the delegates as they chanted, "U-S-A." Read the full text of Donald Trump's speech to the Republican National Convention. As the crowd, fiercely opposed to Clinton, broke out in its oft-used refrain of "Lock her up," he waved them off, and instead declared, "Let's defeat her in November." Yet he also accused her of "terrible, terrible crimes" and said her greatest achievement may have been avoiding prison for her use of a private email and personal server as secretary of state. Action News talked to local delegates on the floor of the RNC as Donald Trump delivered his acceptance speech. He accused Clinton, his far-more-experienced Democratic rival, of utterly lacking the good judgment to serve in the White House and as the military's commander in chief. "This is the legacy of Hillary Clinton: death, destruction, terrorism and weakness," he said. "But Hillary Clinton's legacy does not have to be America's legacy." As he moves into the general election campaign, he's sticking to the controversial proposals of his primary campaign, including building a wall along the entire U.S.-Mexico border and suspending immigration from nations "compromised by terrorism." But in a nod to a broader swath of Americans, he said young people in predominantly black cities "have as much of a right to live out their dreams as any other child in America." He also vowed to protect gays and lesbians from violence and oppression, a pledge that was greeted with applause from the crowd. A protester briefly interrupted Trump. The woman, waving a banner, started yelling more than 20 minutes into Trump's remarks. When Trump began speaking again, he said: "How great are our police?" as authorities took the protester out of the arena. A protester interrupted Donald Trump during his acceptance speech on Thursday night. "As president, my father will change the labor laws that were put in place at a time when women weren't a significant portion of the workplace, and he will focus on making quality childcare affordable and accessible for all," she said. Trump took the stage in Cleveland facing a daunting array of challenges, many of his own making. Though he vanquished 16 primary rivals, he's viewed with unprecedented negativity by the broader electorate, and is struggling in particular with younger voters and minorities, groups GOP leaders know they need for the party to grow. The first three days of this week's convention bordered on chaos, starting with a plagiarism charge involving his wife Melania Trump's speech and moving on to Texas Sen. Ted Cruz's dramatic refusal to endorse him from the convention stage. Then, Trump sparked more questions about his Oval Office readiness by suggesting in the midst of the convention that the U.S. might not defend America's NATO partners with him as president. The remarks, in an interview published online Wednesday by The New York Times, deviate from decades of American doctrine and seem to reject the 67-year-old alliance's bedrock principle of collective defense. Trump reinforced his position from the convention stage, saying the United States has been "picking up the cost" of NATO's defenses for too long. He also disavowed America's foreign policy posture under both Democratic and Republican presidents, criticizing "fifteen years of wars in the Middle East" and declaring that "Americanism, not globalism, will be our credo." "As long as we are led by politicians who will not put 'America First,' then we can be assured that other nations will not treat America with respect," he said. Top Clinton aide John Podesta panned Trump for offering little more than "prejudice and paranoia" and promised she would offer a more positive vision for America when she accepts the party's nomination at its convention next week in Philadelphia.